Sfærernes Musik is one of the most original compositions in Danish music in the first half of the 20th century. 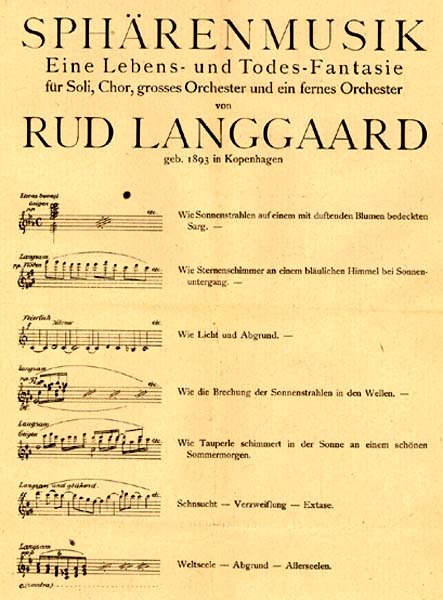 The work was composed in the period 1916-18, and was published the year after (one of the few orchestral works to be published in Langgaard's time). It was performed in Germany in 1921 and 1922 - in Karlsruhe with great success, though in Berlin it was given a more lukewarm reception - and after this it was forgotten or ignored. In 1968, however, the composer, György Ligeti, jury along with the Danish composer, Per Nørgård, sat on a jury set up to judge a large number of new scores by Scandinavian composers. Unknown to the others, Nørgård had inserted the score of Sfærernes Musik. Nørgård noted that Ligeti was paying particular attention to this score, and after a while the latter excalimed, with a twinkle in his eye: "Gentlemen, I have just discovered that I am a Langgaard epigone!". The fact was that Ligeti had realised that some of the technical aspects of this composition - the use of clusters, layers, etc. - in Sfærernes Musik were found again in some of his own works from the 1960's, not least his strikingly innovative Atmospheres (1961). This was a very surprising discovery - the fact that in this work Langgaard, who was relatively unknown, and normally regarded as extremely conservative, was in many respects ahead of his time. Sfærernes Musik was performed in Sweden (Stockholm) in 1968, and thus introduced a renaissance for Langgaard and his music. For Sfærernes Musik, apart from the main orchestra with organ and choir, Langgaard prescribed a fifteen-man "distant orchestra" and a soprano soloist. He also called for a piano with the lid removed, enabling the pianist to play glissandos directly on the strings - an extremely progressive idea, and one not found in any work written before this time. At the same time, this large orchestral apparatus is held back by the composer to a quite unusual degree. Most of the work is played at a very low volume indeed, and the whole orchestra is in fact only called on at the end of the work, which lasts 35 minutes. "In Sfærernes Musik I have in the darkness and despair of night completely abandoned any sort of motif, planned structure, form or coherence. It is 'Music' cloaked in a black veil and the impenetrable mists of death..."
In his thought-provoking book, The Musical Timespace (Aalborg University Press, 1996; 2 vols.) Erik Christensen, a music researcher, offers an interesting analysis of Sfærernes Musik in connection with a number of other works which take the spatial dimension of music as their basic idea. He describes how the 'space' of the work is linited at the upper level by repeated lines of high notes on the violins and flutes, and at the lower level by tympani and deep horns. This open room is filled out with glittering clusters and polyphonic tonal surfaces which remove any sense of time moving forward, and by accelerating repetitive patterns that, on the contrary, make 'time' acutely present. The form of the work is accumulative, and Langgaard divided it into 15 sections each with its own evocative heading. Erik Christensen's analysis uses five different types of music (based on the spacial and gesticulative character of the music), which are arranged in changing formations within a total of four major sections. The conclusion is a vision of the end of all things, in which major musical contrasts - under the heading Antikrist-Krist (Antichrist-Christ)- are ranged opposite each other. This opposition, which is a central theme in Langgaard's music, is expressed here in the form of violent music followed by noisy 'anti-music' (produced by cymbals and kettle-drums) juxtaposed with 'heavenly' music with angel choirs and the sound of harps, which on a final chord (nine-note harmony) at length disappears out into the cosmos. Sfærernes Musik has no other direct parallels in Langgaard's production, but this particular conception of music, centred on tonal and spatial elements at the expense of a thematically-based logical or organic form, is characteristic of the composer. "The celestial and earthly chaotic music from red glowing chords with which life plays with claws of beast of prey - with an iris-crown round its marble-face with its stereotypic - yet living - demoniac and lilly-like smile". In terms of style the composition can neither be described as Late Romantic nor Impressionist; in this case it is more relevant to avoid the usual concepts connected with musical styles and periods, and use the term Art Nouveau instead. The whole idea of the work and its symbolic content seem closely linked to the metaphysical, dream-like, ritual and visionary elements associated with the concept of Art Nouveau and the imaginative world of the turn of the century. The music may even be said to contain ornamental and decorative effects similar to those we know from Art Nouveau artefacts, architecture, etc. The influence of Art Nouveau is also evident from the headings Langgaard supplied the work with. 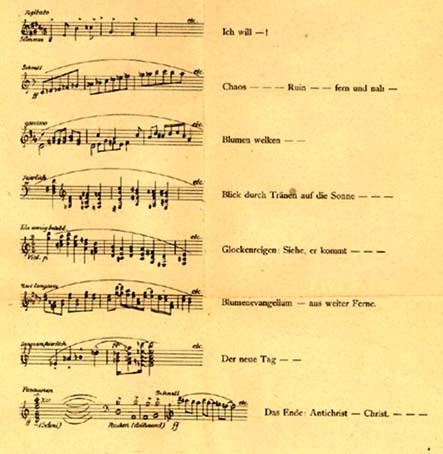 Not all of these are printed in the score, but were published in the programme sheet reproduced below, which was handed out at the first performance in 1921. Listen to examples of some of the sections. Bendt Viinholt Nielsen, 1996, rev. 2007.
wo die Seele träumet und ruht. Publisher (music and text): EDITION WILHELM HANSEN.